In 2013, Kenzo has a new dream for its emblematic flower. 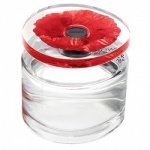 What if the poppy previously planted in the city, could now rise into the air? It would blossom the sky. Kenzo Flower In The Air is a new fragrance creation inspired by a featherlight poppy: an exceptional floral. At its heart is the quintessence of flowers - dazzling rose, magnolia, gardenia - which unfurl in an ultra-feminine, fresh breeze. Punctuated by raspberry and pink pepper, softened by white musk. What if the poppy could float into the air? It would cover the sky in flowers... Kenzo Flower in the Air Eau de Parfum is a modern, fresh and ultra-feminine eau de parfum.